As you can see, I now have a camera with color film. My father bought a new Yashica SLR, and he let me use his old Hanimex twin-lens reflex. 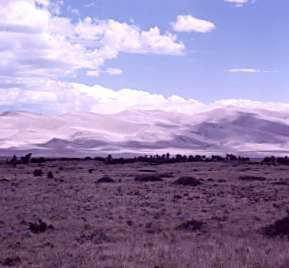 The Hanimex used 120-format film, which produced a large and gorgeous color slide. After we bought our new 1968 Pontiac Tempest, we made another big camping trip out to Yosemite National Park in California. This is a view of Yosemite Valley. 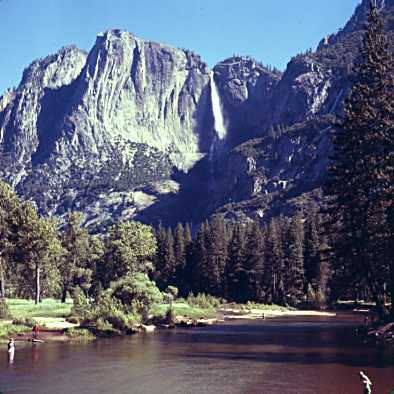 To visit the official web site for Yosemite National Park, click on this link. We also visited Sand Dunes National Monument, in Colorado. To visit their web site, click on this link. We visited Hoover Dam, on the Colorado River between Arizona and Nevada. 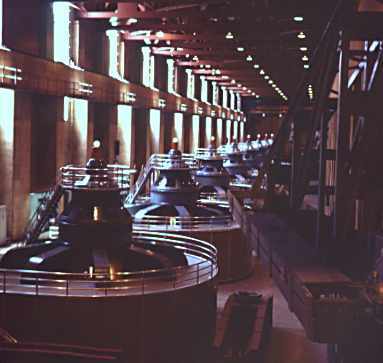 This is the interior of the power plant, showing the big generators and turbines. I remember each generator had a big light bulb on top, I suppose to show if the generator was producing electricity. To visit the official web site for Hoover Dam, click on this link. This is Lowell Observatory, near Flagstaff, Arizona. 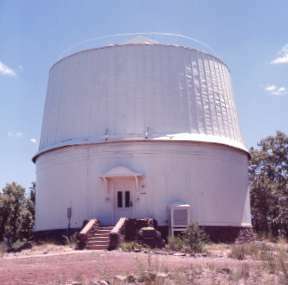 This observatory housed the telescope Lowell used to "discover" canals on Mars. They have other, newer observatories on-site, too. To visit the official web site, click on this link. Here is a view of Niagara Falls. My mother had a good friend who lived in Toronto, Ontario, and we visited several times. To get there, you go right past Niagara Falls, so I have a number of pictures. I even have pictures of the entire falls frozen solid in the dead of winter. 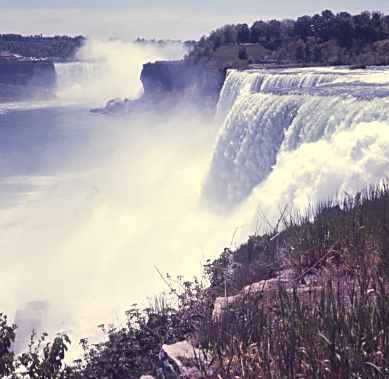 To visit the web site for Niagara Falls State Park, click on this link. We took several camping trips to Canada, which were very enjoyable. 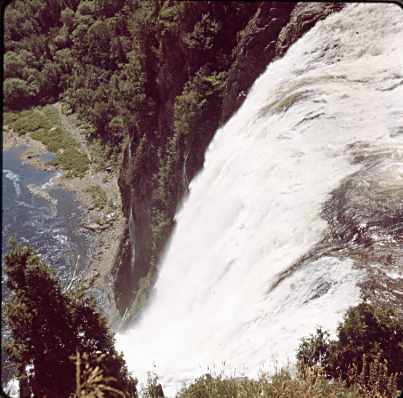 This is a view of Montmorency Falls near the city of Québec. To visit a web site about the falls, click on this link.